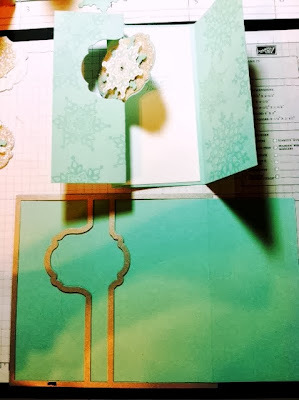 you get 2 Swing (Flip) cards from one piece of card stock! 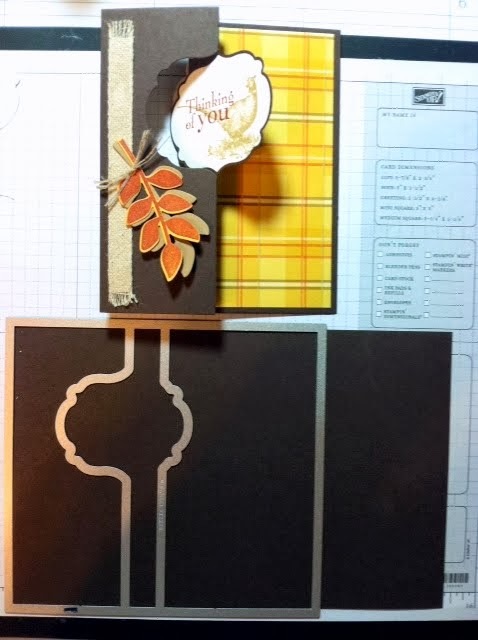 Notice for this Thanksgiving card below, if you lay card stock under thinlit, it will cut and score your card for size just under 5 1/2 (5 7/16) x 5 7/8, cutting off 2 5/8 off of the card stock. Folding on the score lines, gives you a 5 1/2 x 4 1/4 card. For the Christmas Card, slip in card stock to end left side of thinlit leaving the right side of card stock on top of the thinlit! So coooollll! This will give you another score line making it a tri-fold card! After folding on all score lines, you get a 5 1/2 x 4 1/4 card, which also fits perfectly into our beautiful Medium Envelopes pg 162 of the 2013-2014 Catalog. (Whisper White #107301 or Very Vanilla #107300). Also in Clear or Crumb Cake. Sorry for the not so good photos, but you get the idea. Have fun playing with the card thinlits and don't forget to stamp your envelopes too!